She walks aimlessly, her ears burrowed into her jet black mane. There's no one around, at least no one that she can sense, but she likes it that way. Less of a chance of being ridiculed and made to feel like there's nothing left in this senseless world for her. “Way to go, Ve.” She snorts to herself, grinning at the angsty teen outlook she'd temporarily given herself. Of course, despite the fact that she was almost always alone, Vertigo didn't mind the lack of company. Sure, she got lonely every now and again, but that was okay too. Things always got better, so she found no reason to dwell on the bad. The draft mare halted, her sapphire eyes taking in her surroundings. The land here is on the brink of spring, snow still clinging to the hard earth stubbornly. It was still cold enough for the mare to see a slight shadow of her breath, but otherwise, it was evident that the weather would be getting warmer soon. There it was. Another bright side to her day. The female trotted forward again, softly humming to herself. Feathered limbs moved elegantly over fallen logs and branches despite their size. Sure, she was larger than most mares, but Vertigo didn't lack the curves and the femininity that came with being female. A stray vine from her antlers tickled her ear and the Shire tossed her head slightly. The plants were there, tangled in her antlers, as a reminder that life goes on. She was full of metaphors. The maiden chuckled to herself as she continued on. The further into the land she got, Vertigo noticed that the trees seemed to spread out. She'd struggled slightly to maneuver before, but now a soft sigh of relief escaped her jaws. She stopped and shook her whole body, enjoying the feeling of wide open space. Another sigh escaped her, though this one was more reluctant. Once she stepped out into the open, Ve would be bare for the world to see. She'd have to meet new equines, go through the motions of making friends. It was exhausting and usually ended badly for her. for no reason at all, I need you. He'd wandered in among the looming shadows of the deep woods once and, while the experiences of that wandering were likely not rank with his best, once is all it takes to spike Patrick's endless curiosity. So, he has come north east again working his way most cautiously through the whole of the spooky woods. It took him a long time but eventually he came at last to a place where the trees began spreading out and the deep, darkness gave way to shafts of sunlight. I thought I saw a flash of white in that bunch of trees over there. But now I can pick out no further movement. Hmmm... I could just march over and say hello I guess but that does not really seem like any fun. Maybe I can lure whoever it is out if I act like I don't see them? Worth a try anyway. This has been a much longer trip than most others I've taken and honestly, I am starting to get board. The young unicorn boy blinks then gives his head such a violent shake that his ears flop a bit. Snorting sharply he turns, with obviously feigned casualness, away from the spot he'd been so determinedly staring at. This question is asked of the apparently empty air around him in an almost comically loud voice. He stands still then, apparently listening while clearly trying very, very hard not to fidget or turn back towards that very tempting small clump of trees. It is the young boy’s voice that initially draws the ocean mare in their direction. She halts for a moment, a foreleg extended in mid-step, while dainty ears spin to catch the source of the sound, and her eyes glance through the crowd of tree trunks. Spying a flash of the colt’s hip—his color is highlighted by the shaft of light that falls upon him, illuminating his golden body brilliantly among the earthy hues of green and brown—the Mender scarcely hesitates in redirecting her path. With her companion twisting through the air in order to settle more closely at her flank, Tiamat threads carefully through the underbrush. When she breaks through the line of trees and steps into the thinner part of the woodland, she is facing the golden boy head-on. Having always adored children, the blue maiden smiles warmly to him, and lowers her head so that she is closer to his level. “Hello, little one,” her voice is bright and welcoming, “Are you lost?” Her question is an honest one—given that she cannot read his mind, and knows nothing of the game he is playing with the shadows behind him. Considering their location, it is only sensible to assume that he has lost his way. The Mender’s heart goes out to the child. Lifting her eyes, she searches the area briefly, hoping to notice some sign of a parent that she had missed. Not being a mother herself, she cannot understand exactly what it would feel like to lose a child, but with all the compassion of her fragile heart, she knows it is (undoubtedly) a dreadful burden. Her gaze narrows as she explores the darker spaces in between the trees, trying to make out distant shapes and figures—what she doesn’t expect to find is a face. The face of a stranger who is right there with them. “Ooh!” Tiamat cries with a gasp of surprise, her heart leaping into her throat as she stumbles nervously to the side, her head thrown forward in an effort to shield the boy. Nimue, although she hasn’t noticed the stranger herself, reacts accordingly, sounding a piercing whistle and moving back and forth in agitation. It is purely instinct that drives the mare’s reaction, and once she has a moment to actually process the situation, she is able to calm herself down. Breathing in deeply, she composes herself, straightening her posture and shaking her head bashfully. “I’m so sorry—you startled me. I hadn’t noticed you standing there before,” she apologizes to the larger mare, laughing almost shyly as she offers a modest smile. Clearing her throat, the Mender glances again to the boy, looking between both of them. “My name is Tiamat, and this is Nimue,” the little whale, upon hearing her name, burrows deeper into her bondmate’s side with a short squeak, to which the mare can only laugh. in the dark, I will shine to guide you. please tag Tia in all replies! magic & force are permitted. It’s been some time since she’s come to the Threshold. Life in the Edge is busy, and if she’s being honest, she’d avoided most life through Frostfall. It’s a not a season where she is ever at her best, the ghosts of a past she cannot bury too prevalent. It is certainly not a season where she ought to be representing the Edge to newcomers, her ability to be gracious and kind nearly shot by the memories of blood. And the Edge deserved to be represented as it should; as a place that is welcoming (despite the glass spikes, that she still did not entirely love) and kind. But Birdsong quiets the ghosts, brings Lyanna back to herself, and she sets into the new year with renewed vigor. Recalling all the friends she has made, all those she has helped, and all those she has yet to get to know or help. Today, as she makes her way through the familiar forest of the Threshold, a place that holds too many memories (some good, some terrible), a piercing whistle catches her attention. It sounds scared or agitated, and though she’s not sure what kind of creature made that sound, she follows. There might be someone hurt at the end of that sound, and healing her what she does, after all. But soon, a colt and a blue mare come into view, and she catches a few words directed at someone Lyanna can’t see. She makes her way toward the group with a nicker, teal eyes looking the horses over that she can see. No one seems hurt, so perhaps the whistle was just a startle, and the tri-colored mare relaxes a bit. “Hello,” she offers as she closes the distance, her face warm and her smile friendly. “I’m Lyanna,” she offers, falling silent and trying to see the horse who is largely hidden in the trees. The draft mare was dragged from her thoughts by the scent of another equine on the breeze. She snorted to herself and blinked, her large form not moving from behind a set of trees. From her vantage point, all that Vertigo can see of the being is their golden coat. However, the equine speaks, the draft's black ears swiveling around her skull to catch his voice. The female holds her breath, not sure if this youngster is speaking to her or not. She hopes not more so than anything. Not because she's rude, but because Ve had no idea how to deal with children. Though, honestly, she didn't know how to deal with others in general. She was saved from having to make conversation by the arrival of another mare. This one was far from similar to her own large frame. This new mare was blue in color and reminded Vertigo of the sea. Deep sapphire eyes watched as the maiden tried to help the colt, thinking he was lost. Of course, she couldn't have known he came here on his own accord. It was when the marine maiden looked up and spotted Ve's antlered figure that both mares sidestepped in surprise. Vertigo had assumed she couldn't be seen from where she stood, but evidently that wasn't true. The draft snorted loudly and craned her head around one of the tree trunks. Her antlers scraped noisily against the bark in her movement, the female moving out in the open more to avoid making the sound again. “I'm so sorry – you startled me. I hadn't noticed you standing there before.” Vertigo chuckled in embarrassment, shaking her large head. “My name is Tiamat, and this is Nimue.” It was then that the draft noticed the whale swimming in the air's currents. Her eyes widened in curiosity, snorting again. She'd never seen anything like that before and the mare took a step forward to get a closer look. Before she could say anything, another figure found her way into their midst. This mare was lighter in build as well, making Vertigo the oddball out again. Of course, that was something she was used to and only acknowledged the difference in passing. “Hello. I'm Lyanna.” The newest arrival spoke her name as well, making Ve feel like maybe now she had to make light conversation. It was the nicest thing she could do, right? “Hello...I'm Vertigo.” She shifted her weight from large hoof to large hoof, her awkwardness more than evident in her mannerisms. “I didn't mean to scare you,” she mumbled to the ocean mare quietly, swishing her tail in embarrassment. “I promise you frightened me more than I did you.” Her grin was lopsided, though it only made an appearance for a moment before disappearing. There are noises of movement in the trees but they aren't coming from the direction they should have been in if the boy really did see something behind him. His ears swivel in confusion towards the noise ahead but also back behind. In the end the on coming stranger captures his full attention for, where the other (if in fact there is another) has remained hidden, this woman does not hesitate in approaching the colt. A horn of ivory color with decorative etchings sprouts from her forehead, shimmering scales underline her eyes and she is blue-gray-green just like the waters that circle his home. Patrick sighs almost wistfully then his eyes fall upon the hovering whale at the blue mare's side and become very, very wide. Drat! Now I'm not going to be able to play my game. Oh well, she is pretty to look at and the creature with her is something else. I guess that makes up for her being a game ruin-er. Of course the first thing she says to me is the tired old "are you lost". Why is it that every adult I come across outside of the Throat, even those who live in the Throat with me, seem to think I've gotten myself lost if I am anywhere on the mainland side of the bridge? Listen up adults everywhere! I have never been and will never be lost! There, end of story. Of course it isn't, because they can't hear me think it and Pop taught me better manners than to yell at adults... especially if they are being nice. With his gaze riveted to the air-born beast who really ought-not to be out of the sea his answer to the woman's gentle question is given almost absently. For a moment he pulls his blue eyes away from the whale and glances around to find the direction he came in, this being south. He points his nose that way. "back there... waaaaaaaay back there... out of trees." This small interruption settled he focuses on the whale again. His mouth is opening, probably to ask a question, when the lady becomes startled. The boy blinks and his ears flatten at the piercing whistle from the whale but he doesn't move. After a moment he finds that the woman in front of him is now looking at and talking to someone very definitely behind him. At this he gives a triumphant shout. When he turns around however, he finds not just one but two more strangers. Clearly excited now he moves forward with a prance to his step. His muzzle reaches towards the larger of the two not at all phased by her size. Apparently he thinks better of being quite so forward though because halfway through that reach his head ducks to tap his chest instead. His name is added to the exchange with enthusiasm. The boy's head turns towards the black, white and winged woman to offer a small smile. It isn't long before his attention is back on the antlered draft though. He grins up at her colorful flowers with approval. Next he steps back and to the side until he can see all the involved adults and companions. "Where all from? Tell Pat stories?" It quickly becomes apparent that the ocean mare has startled the shadowy stranger as much as the stranger had startled her. There is a mixture of embarrassment and compassion written across her features as she watches the taller stranger step out of the trees, revealing herself to be a sturdy—but undoubtedly beautiful—draft woman. They both chuckle a little to themselves, and Tiamat wouldn’t be surprised if the other’s face burned as brightly as her own. An apology is ready to leave her lips, before a soft whicker announces the arrival of another mare, which consequently moves their conversation on to other things. “A pleasure to meet you, Vertigo, Pat, and Lyanna; my name is Tiamat,” she introduces herself as the others had done, inclining her head to each of them in turn, while a gentle smile rests comfortably on her lips. However, her attention soon focuses solely on the one named Vertigo. The black and white mare expression her own apology, shifting awkwardly as she does so, and appearing rather uneasy. Naturally, Tiamat’s fragile heart goes out to the stranger, her healer’s instinct urging her to relieve whatever discomfort Vertigo might have. When she speaks, her tone is both soothing and earnest, hoping to expunge the draft mare’s worry. “That’s quite alright—I’m sorry to have frightened you as well, it seems we were both in for a surprise. It certainly was the jolt I needed to wake up,” the sea maiden shakes her head with a flurry of chiming shells, laughter lacing her voice and illuminating the shine in her eyes. It is a thing of the past now—an incident for them to share and look back on in what she hopes is years to come (the kindly mare is ever eager to befriend those around her). Then, addressing the boy’s obvious enthusiasm, she continues, a coy glance given to the colt out of the corner of her eye. “Nimue and I,” she motions briefly to the quiet Leviathian hugging her flank, “are from the Aurora Basin, in the northern mountains. I’m a healer there, and it is a beautiful place.” It is recognizable by the lilt in her voice that Tiamat adores her home. She cannot speak of it without a wistful smile softening her lips, thinking of the haloed peaks, fresh grasses, and breathtaking views. She cannot think of a Helovia, or a life, without it. The Basin and its herd have given her so much more than a place to live—she has a home and a family. “Did you know…” Tiamat goes on, looking again to the golden boy and his thirst for stories, “on starry nights, well after the sun has set, the sky comes alive with colors! They dance in ribbons across the horizon—greens, reds, purples, yellows, and blues—it is truly a wondrous sight!” Her demeanor brightens and she chuckles, broadening her gaze to include Lyanna and Vertigo. “Perhaps you will come see it sometime,” she suggests welcomingly, with an air of mystery thrown in for Pat’s sake (and she cannot hide the amused smile that quirks her lips). The mare that comes out of the trees is far larger than Lyanna, though she thinks nothing of it. She’s rather used to feeling small around the Edge, with Tembovu towering above her for one, let alone many others. Size has never been an indicator of beauty to Lyanna. 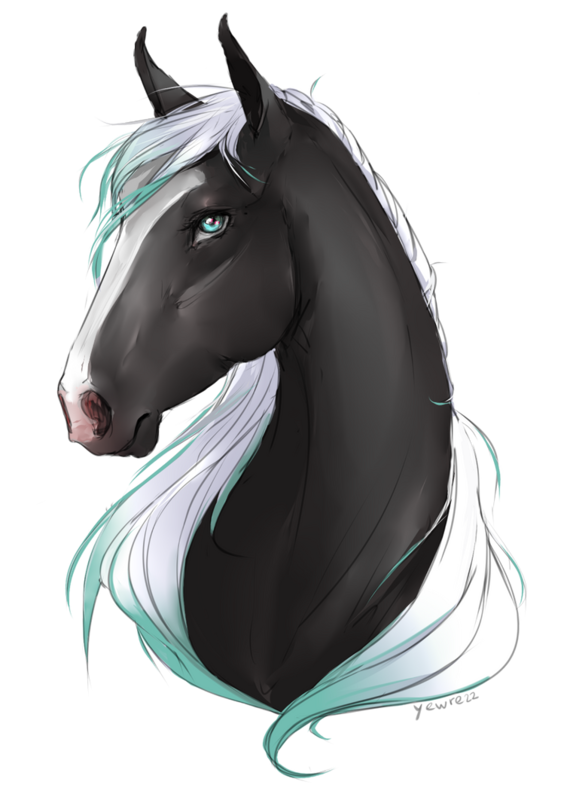 The black and white mare – who introduces herself as Vertigo – is in fact rather beautiful in her own way, and Lyanna’s teal eyes linger momentarily on the flowery vines that weaver through the mare’s antlers. But soon her eyes switch to the boy, who is entirely too young to be alone here, but she’s quickly beginning to realize that happens a lot in Helovia. It is not unusual for her to find some child standing alone in a crowd, and she’s begun to think everyone just feels shockingly safe here. Even though sometimes, that is anything but true. As a whole, Helovia does feel safe. The herds feel untouchable. But she knows that such feelings are deceiving, lulling them all into a false sense of security. Nothing is as safe as it appears. She would know, after all, her own home the picture of peace and safety, ripped apart with a few well places knives. The boy says his name is Pat, and asked for stories. Tiamat – the sea mare who introduces herself and the whale at her side – begins to speak first, and Lyanna listens attentively, not interrupting. Tiamat goes on to talk of where she is from, stating she’s a healer, and Lyanna’s eyes warm a little more at this knowledge. She has yet to really get to know the healers of the other herds, though she would like to. It would benefit them all to open lines of communication and herb trades, since each herd had many different things to offer. Tiamat invites them – though largely Vertigo, she’s sure – to see the lights. At this, Lyanna smiles a bit more, nodding at Tiamat. “I have seen those lights in the sky, and they are more beautiful than words can describe. Though I don’t come from the Basin. I live in the World’s Edge and serve as a healer there,” She casts a quick glance to Tiamat over their shared profression before continuing. Lyanna’s smile is kind warm, her words genuine. Because she remembers being in Vertigo’s shoes, remembers having no idea what the names of these places meant that others simply threw at her. She’s chosen the Edge because they’d offered her a place to get her bearings, and in the end, she’d decided to stay. They had welcomed her without question, and though some days she struggled to feel like she belonged, it was not the fault of her herdmates, but her own heartache for the family and the life she had lost. The golden colt made is approval of the two toned mare evident quickly, smiling and voicing his appreciation of her decorative vines. Pat, as he said he was called, was all too eager to demand stories in his enthusiasm. Vertigo raised her head slightly, not really quite sure how to handle the colt's eagerness. She was saved from having to speak by the blue mare, Tiamat. The female's appearance was more than friendly, what with her twinkling eyes and laughter. She was someone Ve could easily see herself being friends with. That is, if she ever came out of her shell and actually tried. Tiamat spoke to the colt of her land, almost as if she were speaking of a beloved friend. The draft could tell how proud of the Basin the ocean mare was, her description nearly making the mare head there herself. The female continued on, describing a light show that Ve nearly couldn't believe existed. She'd never seen, let alone heard, of such a thing before. The unicorn tilted her head slightly, intrigued at the idea, however. How beautiful and amazing it would be to see such a show! Vertigo's attention returned to the other female as she felt her gaze. She hid her own gaze behind the vines that hang loose from her antlers in embarrassment. No, the mare wouldn't want her there. She was only good for talking to when you didn't want anyone's opinion. Sure, once she got comfortable she would be a nonstop talking machine. For now, though, she was of no use to anyone. It took awhile for her to come out of her shell, for that was the trouble she was having now, surrounded by others who wanted to befriend her. At least, that's what she was assuming. Why else would they have stopped here? A thoughtful expression overtook her features as she dwelled on her mind's own inner workings. Looking at her, one could assume she was merely thinking about the land just described. No one might guess that, in fact, she was questioning herself. Another voice chimed in, making Ve blink herself back into the conversation. The other black and white female was speaking now, though the larger mare only just now realized that there was another, brighter color floating amongst the ebony and ivory. Let alone the fact that she had wings. How had she missed that before? Vertigo snorted to herself almost inaudibly, embarrassed that she'd been so caught up in herself that she failed to really notice those before her. Lyanna seconds the beauty of the light show, the second opinion on the anomaly calling to Vertigo all the more. She goes on to describe her own land, the description just as beautiful as the one Tiamat had described. “You would be welcome to see it as well, and stay if you wanted to call the Edge home.” Ve blinked in surprise, taking a half step back. Patrick is obviously struggling to remain still while also waiting hopefully for his requested stories. The blue mare takes this opening smoothly and offers up an entrancing description of her home land. Her words about dancing colors in the sky bring another bright grin to the boy's face. There is little chance, even for Pat's quick tongue, to say anything more in response before the winged woman picks the dangling thread up with her own story. This tale is of mysterious, misty forests and towering cliffs. It too clearly fascinates the youngest of the listeners for his eyes grow wide again. I like color and I would love to see this mare's colorful skies. Color reminds me of Mom and Ko which sets me to wondering if Ko could make the sky above home dance with color in the way Tiamat describes? I'll have to ask her. The second land mentioned sounds no less grand. However, I decide here and now that Lyanna could use some lessons in story telling. Tiamat should teach her I think. Of course, I've heard the names of both places before. The first from a spotted woman accompanied by the oddest creature I've ever seen, yes even odder than a flying whale, and the other from some kids I met in the deep woods. I've never sought out more than the names in the past though. The most interesting thing that I hear in all of this is that two of these mares are fixers like Najya. Maybe they even know her? Once the adults finish their stories the boy clears his throat politely. He is not quite patient enough to await permission to speak though and is rushing ahead to his next question in no time. "Ummm... Teeea, Leeea, know Gold-crown? She fixer too, in Throat.... teach Pat, Pat hope." The near silence from the largest mare catches the young unicorn's attention now and he turns towards her. He finds that her head is ducked down and he can not see her eyes. This doesn't put him off though. Short as he still is he can get his face up under the vines simply by taking a step or two nearer and ducking down a little. Only a second or two passes before he is attempting to do just that and if he manages it he'll likely be blinking quizzically up at her as he asks yet another question.
" 'course want! Why not?" Not long after the ocean mare finishes her description of her homeland (colorfully embellished for the young boy’s sake), the group’s attention collectively turns towards Lyanna when she begins to speak. She reveals that she comes from the World’s Edge, which perks the blue mare’s ears. She thinks of Mesec, her friend who also shares the forested, coastal home, and tells herself (not for the first time) that she must travel and see the land for herself. While she would never consider abandoning her own highland valley, she does wish to visit the other herd lands—they are all a piece of Helovia, are they not? She sighs quietly to herself, caught for a second in her own thoughts, before another piece of information snatches her focus. Lyanna says that she is a healer as well, which—of course—brings a wide smile to Tiamat’s lips. She even reaches out towards the winged mare, hoping to mingle their breaths, and befriend one another in this beautiful path of life that they share together. It swells her heart with warmth to feel connected to another mare, rather than be divided by petty borders and politics. Pat, too, is apparently excited by this news. White eyes turn to him when he clears his throat (she has to fight an amused smile at his young antics), and she listens as he speaks with broken sentences, describing someone else—a healer, she understands—who lives in the Throat with him. “I’m not sure that I do,” Tiamat answers his question as her brow briefly furrows in thought. “Although I hope she teaches you, too—it is a valuable skill to learn, with whatever course you plan on following. Perhaps I can show you a few things someday!” Her eyes are alight with excitement, ever eager to share her knowledge, especially with someone as impressionable as the golden boy. It would be so good for him to learn. Her attention then follows his to Vertigo. The draft mare is noticeably surprised (shocked, even) by Lyanna’s invitation to join her in the Edge. Tiamat’s head tilts sympathetically to the side, and she lowers her head to search for the mare’s fallen gaze, hoping to reassure her that of course she is welcome! Pat, again with his humorous antics, has the same idea. The sea maiden can’t help but chuckle at his simple explanation. “Well said,” she praises the boy as she brushes the top of his rump with her muzzle, almost as a mother would. Searching still to meet Vertigo’s eye, she continues Pat’s thought, speaking with earnesty and warmth. “I know the Basin would welcome you with open arms, and I’m sure their herds can say the same,” she gestures to the other two. She doesn’t know much about the other herd lands, but she can’t imagine that they would be any less accommodating. Wherever Vertigo chooses to be, Tiamat hopes she can find home. “No one needs to be alone,” the blue mare murmurs, smiling gently at the large stranger. She turns to Pat at his question, “No, I do not know Gold-crown. But I hope to come to the Throat soon and meet her. And the Basin as well, if you’d be interested Tiamat. We could exchange herbs and knowledge.” She wanted to open the lines of communication between all the healers. Their job was to heal, regardless of what herd anyone came from. They would all be better equipped if they had herbs from the other herds and knowledge of how to use them. But her attention is pulled back to Vertigo, who seems shocked at the offer of a home. This is why Lyanna comes to the Threshold. It’s not because the Edge needs members. The herd was bursting with life. It’s not because she has nothing better to do, as was once the case. Lyanna is kept busy all the time, and when she is not doing the things she must, there’s a list of things she wants to do. She comes to offer homes to those that are no so different from her. Lost, alone, thrust into this new world for whatever reason they have come here. Some by choices, others (like her), because they’d been forced to. The reason doesn’t matter; no, it simply matters that Lyanna can offer them a place to feel like they belong. Perhaps Vertigo will not choose the Edge, and that’s fine. Going home with either Pat or Tiamat would still give her a home. But Lyanna never forgot the kindness of the mares that had found her in the Threshold little more than a year ago. Without them, she has no idea where she would have ended up. Perhaps she’d have left Helovia, continued to some new land farther still. Or gotten turned around and sent herself back in the direction of Morham, a direction she could not go. Vertigo listened as the three equines conversed with each other. Their conversation lead from the blue and tri-colored mare realizing that both were healers, to the colt asking if they knew a healer from his land. Ve began to wonder how nice it would be to learn the art of healing. She'd be able to make everyone else's life better, like she'd wished someone had done for her when she'd been lost and alone without anyone else. Sure, she hadn't been physically hurt, but the emotional hurt was just as bad, if not worse. After all, she couldn't go a few moments without questioning herself. That couldn't be healthy now could it? Her question of being wanted and her silence attracted the attention of the colt. His attempt to make eye contact with her was comical and, though she tried not to, Vertigo found herself smirking slightly. He was adorable, even if the Draft had the slightest idea of how to interact with children. She smiles wider at his statement, no longer lost in her own self-pity. “Thank you, Pat. That's...kind of you.” She reaches out a nudges him softly in appreciation. It was hard to think of oneself was wanted when no one else in her life had. Ve thought of herself as a burden, ugly and her company worthless. Though it was odd for her to encounter others who thought otherwise, Vertigo was pleased that the trio before her were kind enough to include her. Tiamat agreed audibly with the colt's words and the two toned mare offered her a smile of thanks. She relaxed slightly, lifting her head a little so that she could meet everyone's gaze in turn. The oceanic female continued speaking, going so far as to inviting Ve to her own land. “No one needs to be alone.” Vertigo swallowed hard, the action audible as she tried to hold back tears. They were happy tears, for the maiden couldn't imagine her luck at finding such kind equines on her first journey into these lands. It was promising as to what the rest of her adventure would bring. Vertigo felt comfortable enough here that she decided it was time to be more outgoing. Of course, that was going to be a hard habit to break, but she had high hopes for herself. How could she not when these three seemed to believe in her? Lyanna spoke, grabbing the Shire's attention. Her ears perked forward, brushing against the vines in her antlers. Ve nickered a thank you to the female in response, looking from each equine to the other. “I can't tell you how happy you've all made me. I wish I'd known kind souls like you before,” she hesitates, looking at the ground momentarily. With a deep breath she regains her composure and her smile returns to her features. “I'm honored that you all would go so far as to welcome me into your homes. It is a kindness I'll never forget.” She tilts her head, her grin growing wider. As the sandy colt asks his big question both resident Helovian women seem lost in thought. Tiamat, of course, responds first saying that she does not know his hoped for mentor. The boy looks just a little down cast at this but he brightens up again when the blue lady suggests teaching him too. "Oooo... yes, yes! Please! Pat come Basin, next adventure, see lights, find Teeea, learn all the things!" As before, the winged woman is offering her answer without much pause. Pat turns his blue eyes to her. She too does not know the mentioned Sun Physician but she is quick to express a desire to meet her and that is pounced upon as happily as Tiamat's offer of lessons. "Yes! Gold-crown like, talk 'bout gathering things. Leeea come to home with Pat? Maybe meet Pop too..."
Oh! Lessons are one of my favorite things. I think only gathering is higher on my list. I hadn't expected to be offered them that easily. Sooo going to take her up on it too. I wonder if she will be surprised when I show up at her door step. I will have to find a way to bring Ko along though, she just has to see those lights! I am happy that Lyanna seems so interested in meeting Najya even if I am confused that neither mare knows her. It just seems to me that everyone should know Najya... though now that I think about it, I am not sure why. Well, anyone who wants to meet her can totally come back home with me. This is the point at which, with the encouragement of both healers, his attention focuses completely on the new comer. The boy does in fact manage to worm his way in under the flowery vines and, thankfully, the large woman seems to find this amusing rather than annoying. He even manages to get a smile and a friendly nudge out of her, imagine that! Patrick's grin mirror's the one on the mare's own face for a second before he backs up again. His small, horned head nods sharply at the next words. "Good! Teeego no be afeared. Edge nice, Basin nice, Throat nice too! Ummm... Throat have much water, much sand, big old tree, big gate-guard, magic bridge... all good." Apparently he felt it wasn't fair to leave his own home with no description among all these stories. He falls silent and still after this final enthusiastic speech however. There he stands, having migrated back towards the middle of the group, simply looking from one adult to another with questioning eyes. What next? The black winged mare doesn’t seem to know who this gold-crown woman is either, which appears to dampen the colt’s enthusiasm (for half a second), when Lyanna suggests meeting in the Throat and Basin. Tiamat’s eyes brighten in response, absolutely thrilled by the idea. “I would love that! I’d like to see the Edge as well,” the ocean mare hums happily, smiling wide and brilliantly as she imagines days of herbal knowledge and budding friendships. There are few things in the world that pique her interest more than these, and her heart swells, brimming even more so when the golden boy announces his attendance as well. “I can’t wait to see you there!” The sea maiden laughs gleefully, her eyes shifting between each of them before resting on the quietest one of their group. Vertigo’s silence initially worries the Mender—have they intimidated her somehow? Is she uncomfortable? What can she do to help? However, as the moments tick by and she studies the draft mare’s pretty features, she notices that Vertigo is, indeed, emotional—but it would seem with happiness, rather than any sort of unease. The words that the Shire mare speaks are obviously so saturated with comfort and relief, that Tiamat feels her own throat tightening just watching her. She wonders what this poor woman has had to endure in her life, that their simple invitation of kindness and friendship has moved her so deeply. Has she really been so horribly deprived of compassion? Not wanting to dwell too much right now on the possible answers (her heart is already laden with enough sadness), Tiamat turns her eyes—quickly blinking away the moisture that suddenly blurs her vision—to Pat when he speaks. His enthusiasm and young innocence are endearing. “All good,” the blue mare repeats softly when he finishes, taking the simple statement to heart, and broadening it towards life. (Because that’s what life should be, isn’t it? Good?) “I feel just as honored to have met you, my friend. All of you,” her eyes roam over all three of the others, her words sincere. She really didn’t want to show up empty handed. If they were going to exchange knowledge and herbs, it would be better if she brought some with her, along with the offer to let them come to the Edge. Tiamat is excited at the prospect though, already stating that she’d like to see the Edge. Which means Lyanna can send her home with whatever herbs she desires. Maybe Tiamat would have an idea about Ru’s lack of voice…or this Gold Crown Pat speaks of. Lyanna tries not to be hopeful about that, instead smiling a little brighter at Tiamat. “I would love to show you around.” she says to Tiamat, but casting her eyes to Patrick as well to include him. The more the merrier. She did love talking about herbs and the Edge, and getting to know others in Helovia. She could use more friends. The handful she had were good friends, don’t get her wrong, but sometimes she still felt alone in this place. It would be nice to know more faces, to count a few of them in her group of friends. When Vertigo speaks again, it is laced with emotion. Even Lyanna, despite all that had happened in her life, had grown up knowing kindness and love. She’d been grateful for the kindness shown to her when she stood in the Threshold with nowhere to go, but not shocked by it. Vertigo though…Lyanna can’t help but wonder what has happened to this mare in her past. Whatever it is has not darkened her spirit though, it seems, for the mare is kind and genuine. Pat and Tiamat both speak up, and their words are beautiful and true and Lyanna nods as they each finish. She isn’t even sure what she can offer otherwise. It’s strange how easily what could have been a rather traditional, so to speak, meeting in the Threshold where she’s never gotten to know anyone, has turned into so much more. “And no matter what you choose, you will have friends to visit when your legs need a good stretch.” She says, smiling warmly at Vertigo, and then to the others there as well. She would be happy to see any of them in the Edge for a visit. Yup, definitely most gooey Threshold thread ever. Love it. Vertigo was quite amused by the youngster's antics, though she still wasn't quite sure how to handle him. Pat made sure to get his own land involved in the home offering department and the draft couldn't help but grin. If he was any indication as to how friendly the rest of the equines in his homeland were, well, it was no wonder they let him roam as he pleased. The female chuckled as he looked back and forth between the lot of them before she turned her sapphire eyes onto Tiamat. The azure equine seems moved by Ve's words, though she hopes it's not because she feels sorry for her. Sure, the teasing at paid it's toll on her, but she wanted to feel welcomed, not pitied. She speaks next and Vertigo is pleased to hear that she's just as grateful to have been acquainted with the lot of them. No matter what decision she makes, the two toned maiden has a feeling that she'll be traveling a lot to visit her newly found friends. “Wherever you choose to go, I hope you can find a home as well.” The words of encouragement send another wave of emotion through the antlered mare, but she's able to rein them in this time. “Thank you, Tiamat.” Ve turns to Lyanna, the pretty winged mare offering just what she'd hoped for. Friendship. It was one thing to assume you had it. It was a totally warming feeling knowing that the winged mare felt the same friendship blossoming that she did. Sure, they'd all only just met. But somehow, someway, they'd all bonded. It was odd for Vertigo to feel this way, wanting to be with others for company. She could most certainly get used to it, however. The female smiles softly, her ears flopping sideways in embarrassment. Sure, the idea of grabbing life and living it was a great one. Practicing it would take a little getting used to. And time. Vertigo looked to the smallest of her new friends and then to the Lyanna. “However, know that I'll be visiting you both soon, if that's okay?” Her words came out more of a question that she had intended, but it was progress. She'd get there. Tiamat seems properly enthusiastic about Patrick's firm promise to find her in the Basin for additional lessons. She is equally excited about the prospect of venturing to the Throat to meet the healer he speaks of. This causes the boy to beam even brighter making it clear that he thinks quite highly indeed of his chosen teacher. Lyanna continues to seem pleased with the prospect as well but she quickly sets herself apart as the practical one in this group. When Patrick invites her to come back to the Throat with him now she insists, quite sensibly, that later would be a better idea. The boy's head tilts thoughtfully to the side at this but it doesn't appear to disappoint him in the same way as their earlier statements about not knowing "Gold-crown" had. After a moment or two he gives a sharp nod of agreement. "K! Ummm... want Pat tell Gold-crown... or want 'prise?" When the winged woman tells the blue that she'd be glad to show her around the Edge her gaze drifts to include the listening colt too. At this Patrick's eyes sparkle happily. Now he has an invitation to both non-Throat herd lands, what fun! Things begin to wrap up around this time as the spotted draft mare declares her intention to join Tiamat in the Basin. She also seems quite interested in the opportunity to visit her remaining two friends in the future though. Again the colt nods. "Yes! Teeego visit too! When get south sands, go gate, yell 'Pat'. Pat let in... all three! Aaaannnddd... Pat come Basin, Edge, next adventures... no forget." Yay! Planned lessons, planned adventures, and planned future visits to me in the Throat. I guess I better get my hooves on a key, soon-ish. This requires getting back home which is quite a long way away. Better move it then. Stepping towards each adult in turn he extends his muzzle one last time. "Pat go now... home looooonnnngggg way." That said he turns determinedly south and with a flip of his little tail is off into the woods. All eyes rest on the antlered draft mare, each one waiting for her decision. It would seem that Vertigo feels the weight of their attention on her, as she clears her throat and hesitates for a moment, pausing briefly between words. When she does manage to voice her selection, the ocean mare feels herself swelling once again with excitement. While she would have been happy for the larger mare with any of the herd lands, she is understandably biased when it comes to her own cherished home. Her smile broadens and she reaches out, seeking to brush Vertigo’s muzzle with her own. “Of course! I’m sure you will not be disappointed,” she reassures the other unicorn happily, unable to contain the joy that enlightens every line of her delicate features. Even Nimue, influenced by the mare’s feelings through their bond, offers the draft woman a whistling chirp of excitement. Tiamat laughs softly to herself, lowering her head as she strokes the Leviathan’s smooth head, exhaling a warm breath across the little whale’s skin. She listens as the young colt pipes up about visiting the other herds, joining them all in their promised journeys across Helovia. Tiamat finds herself looking between all of those gathered, her wide smile softening into one of familiar affection. Never one with inhibitions, she has already accepted them into her heart. “Sounds like we have plenty of adventures to explore together—what fun!” She laughs blissfully, genuinely excited to spend more time with them. She had hoped to find a lost soul here today, but she had found so much more! Tiamat breaths a contented sigh through her nostrils, touching her nose to the boy’s when he offers it. “Travel safe, Pat; I hope to see you soon,” her motherly gaze trails after him as he scampers away, watching until his golden hide disappears in between the thick forest. Only then does she shift her eyes to Lyanna, her fellow healer. “It was a pleasure meeting you, honestly, I very much enjoyed our time together,” the sea mare grins as she extends her nose to the pegasus in a gesture of friendship. In all of the chaos that has haunted her in recent misfortunes, the ocean mare needed this. At last, her attention returns to Vertigo, the star of their meeting. Gesturing with the tip of her horn towards the northern mountains, she angles her body, and smiles another broad grin. “Shall we be on our way?” The length of her tail flicks around her ankles in her excitement, always eager to return to familiarity and security of the Basin’s valley.